All you need to know about disc issues - Matthew D. Hepler, M.D. Healthy discs separate the bones in our spines from the neck down to our lower back. The term ‘slipped disc’ is commonly used to describe a source of back pain, but unfortunately, it is not a very precise term. After all, discs don’t really slip. They bulge, protrude, or herniate. During everyday, natural movements, it is normal for discs to bulge a bit because of the pressure put on them, but it is not enough to affect the surrounding nerves. The pain begins when pressure is put on the nerves, which happens when a disc goes beyond its normal boundary. Symptoms vary depending on where the bulging disc is and what nerve it is pressing against. In the low back, bulging discs can cause radiating pain into the hip or buttock region, and even into the leg and foot. This problem can present itself in the form of pain, numbness and/or weakness. 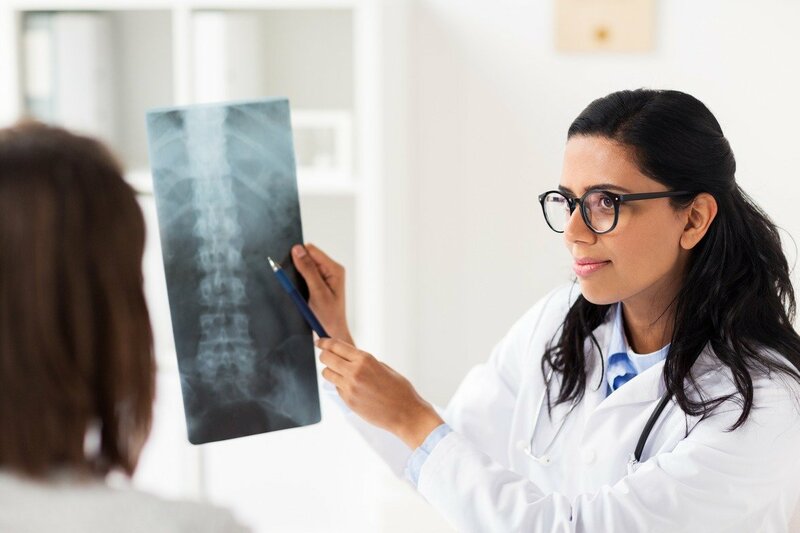 Depending on what the initial physical exam results are, our spine surgeon in Palm Beach County and back surgeon in Fort Lauderdale may send patients for an MRI so the doctors can get more information on the extent of the disc involvement. In many, manual adjustments and physical therapy are very effective in relieving symptoms while correcting the underlying root cause of the problem. In some cases, surgery may be required. The two main problems that can develop with a spinal disc are premature degeneration (wearing down too quickly) and displacement (bulging or herniated). The pain that is common to these two conditions arises from irritation to the nerves in the area of the disc. It is usually localized, radiating pain, weakness or numbness. In severe cases, a person may be unable to move. If the disc problem is in the neck, the pain produced may be felt in the neck itself, as well as in the shoulders or arms. If the disc issue is in the low back, the pain can be localized to the low back, or involve the hips, buttocks or legs. The second problem is called sciatica because it puts pressure on the sciatic nerve, a large nerve which runs down the entire length of the leg into the foot. Bones change shape due to stress. During prolonged or constant stress in an area, the muscles tighten and, in turn, pull on the vertebrae they are connected to. This can cause one or more bones to move out of their normal position. This condition is called subluxation. Subluxations can be the result of trauma (falls, auto or sports injuries), poor posture, or repetitive stress. These misalignments challenge the ability of the bones to move normally. When the motion of a bone in your spine is restricted, the body often compensates by allowing the bones above and below it to move more (called hypermobility). Hypermobility causes wear and tear by causing the bones to physically enlarge to withstand the extra stress placed upon them. As the bones enlarge, the discs located between them wear down and become thinner, creating a narrowing of the opening where the nerve sits. Such a condition is called osteoarthritis or degenerative joint disease (DJD). Maintain a general exercise program that keeps the spine flexible and the back strong. Focus on your mobility to allow the muscles to be strong and support your spine. Our spine surgeon in Broward County (back surgeon in Fort Lauderdale) tailor-makes exercise programs for patients after a comprehensive examination. Maintain good posture and avoid slouching – this includes choosing furniture that supports the spine both at home and at work. Remember to pay attention to your posture and it will become an unconscious habit. Get regular chiropractic adjustments and some type of bodywork to reduce the build-up of muscle tension patterns. If you have a condition that has predisposed you to misalignment issues such as scoliosis or ankylosing spondylitis (an autoimmune disease affecting the spine), or you have a history of trauma or poor posture, it is important for you to receive more frequent consultations and checkups. If you suffer from pain, please consider calling us for a FREE consultation. We’ll tell you if we think we can help get to the root of your pain; to the cause behind the symptom. Dr. Hepler is a leading orthopedic spine surgeon in Palm Beach County and Fort Lauderdale with fellowship training in both adult and pediatric spine surgery. He has a subspecialty interest in complex spine reconstruction. That includes scoliosis, kyphosis, and spondylolisthesis, but he treats all spine conditions, including disc herniations, radiculopathy, discogenic disc disease, lumbar and cervical stenosis, traumatic and osteoporotic fractures. He is also an expert in back surgery and spinal stenosis treatment in Palm Beach County.